Hiroji Kiyotake (清武 博二 Kiyotake Hiroji) is a game designer for Nintendo, and also the original designer of Wario. Kiyotake is one of the directors and graphic designers of Super Mario Land 2: 6 Golden Coins and Wario Land: Super Mario Land 3, making him one of the key people for the introduction of the character Wario and the Wario franchise. He was also involved in the development of further Wario games as a designer; for Virtual Boy Wario Land, he acted as a director again. However, for Wario games released after Wario Land 4, his role is mostly limited to the Wario design and advising, according to the staff credits of the respective games. For example, during the development of Wario: Master of Disguise, Kiyotake supervised the numerous forms of disguised Wario designed by SUZAK. In addition, Kiyotake is also the original designer of Foreman Spike from Wrecking Crew. In the credits of many sports and party titles of the Mario franchise, he is mentioned as one of the character designers. Whenever I had the idea for a character—not only Wario—the first thing I would do is talk it over with Hosokawa. If he thought it was cool, I’d present it to the rest of the staff. Then, once I thought the idea could work, I’d discuss the details of the sprite animation and movement with Harada. That’s the process I went through for Wario and all the other characters in Super Mario Land 2. 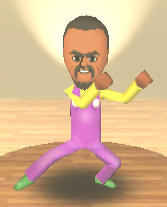 Hiroji Kiyotake's Mii in the credits of WarioWare: Smooth Moves is one of the few Miis wearing purple overalls, a yellow shirt, and green shoes like Wario, a nod to Kiyotake's role as Wario's creator. Kiyotake is also responsible for designing characters in the Metroid series, including Samus Aran. This page was last edited on April 11, 2019, at 19:30.